If you’re going to hurt your back, it might as well happen at the Bulletproof Conference. My itinerary was set. It included a visit to the new Bulletproof Labs in LA, maximizing time in the speaker hall to hear all the latest research on biohacking, and spending heaps of time in Tech Hall aka "Disneyland for health optimizers." My planned itinerary took a big hit on day one mid-morning. While I was at the end of my soak in an ionic foot bath in the BP Tech Hall, my back just locked up and I was unable to move. Perhaps it was the drain of travel or some said the foot bath itself drains all the minerals and metals, I'll never know. (Note: if I ever do an ionic foot bath again, I will take loads of binding charcoal first and some minerals and fish oil afterwards). This kind of injury would normally render me flat and out of commission for a few days or weeks. Lucky for me, I was in the healing mecca - The Bulletproof Conference Tech Hall. Enter the Tech Hall and your head starts spinning with wonder and excitement. There are inventions like the Bulletproof Vibe, drinks like mushroom and matcha tea, and food demos such as Bulletproof ice cream. Most booths are manned by the owners and founders which puts you in the perfect position to launch powerful questions to the innovators. My back injury occurred mid-day on Friday and I was immediately escorted to the Rapid Release booth. A chiropractor used a high vibration pain therapy tool on me for about 25 minutes. I was a little looser, but still acute. From there, I checked out the PEMF (Pulse Electric Magnetic Frequency) technology from Pulse Centers. I could not sit so the device was held against my back and I felt a pulsating feeling in the front of my body where my hip flexors reside. Next, I went to the Joovv red light therapy booth. After five minutes on the full bed of healing red lights, I drifted into a deep state of relaxation. These red lights are a little different than the ones you'd encounter in Amsterdam. Red light therapy is getting a lot of attention in the anti-aging, pain relief, and mitochondrial health arenas. I reluctantly relinquished my position when my friends asked me if I felt well enough to check out the next speaker. I could hardly believe it. I was mobile and ready to learn. I wondered how stiff I would be in the morning. At bedtime, I loaded up on curcumin, magnesium, CBD oil, and ice for inflammation. My coach friend, Shelli, propped up pillows in just a way under my legs so no pressure was on my back. The next morning, I gently turned over and was still sore, but mobile. Woot woot! I was ready for day two of the conference. I gingerly entered the hotel shuttle and as we settled, who approached our car, but the founder of Bulletproof, Dave Asprey. We invited Dave and his bodyguard to travel with us to the Pasadena conference center and I told him about my back injury. He suggested an IV infusion with glutathione and magnesium which is of course possible in the Tech Hall. I signed up for the longevity infusion and struck up a conversation with Sebastian, a gentleman seated next to me. Sebastian is the son of Peter Wasowski who founded Vasper. I told him that I've always wanted to try Vasper ever since I listened to a podcast on Bulletproof Radio about it. I informed Sebastian about my back injury and explained how bummed out I was because I really wanted to try Vasper. He told me that it could actually help me and brought me over to meet with his father Peter (the founder of Vasper). Peter explained that this type of exercise while cooling will create more growth hormone in my body which will accelerate the healing of my back. 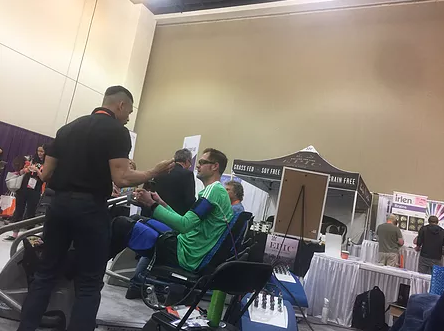 I sat on a recumbent bike and the Vasper team placed cuffs like big blood pressure cuffs filled with cooled water around my thighs. Next, the cuffs started squeezing me. Once they were the right pressure, I was instructed to pedal slowly for 20 minutes. 20 minutes is the equivalent of a couple of hours of intense cardio exercise. Once finished, I was taken to the cooling mat where I relaxed my muscles for 10 minutes. When I got up, my back was feeling pretty loose and I began to feel the pangs of hunger. Vasper is the perfect workout machine for anyone who may have an injury or for someone seeking higher intensity workouts in a shorter amount of time without the damage to the body that occurs with exercise. By the afternoon of day two, I was feeling pretty good and ready to listen to more speakers including Dr. Zach Bush, Dr. Mercola, and Esther Perel. I had tried cold laser therapy, visited the PEMF booth again, and even found some experts to discuss gut health with some surprising revelations about lectins that I will cover in another post. This was my second visit to the Bulletproof Conference and it continues to amaze me. These folks are really walking the walk. All the food available for purchase at the conference adheres to the Bulletproof Diet and many area restaurants provide a Bulletproof menu. The BP diet is a low inflammation diet that focuses on eliminating the foods that weaken you and maximizing the foods that make your brain work, make you strong, and your keep mitochondria healthy. If this sounds like a conference you'd like to attend, mark you calendar for the second weekend of October 2018.